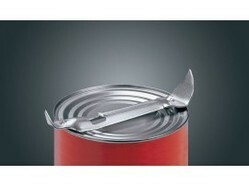 - Keep rolling with the punches with this Can Opener, efficient and effective. - Can quickly open the can of juice by simply punching the lid of the can and pouring out the juice they need quickly and efficiently. - Perfect for cafeterias, restaurants, and catering services. We are importers of Can Opener, Bottle Opener, 6-in-1 Can opener. - Opens extra large cans. Paint :- Epoxy Smooke Gray.